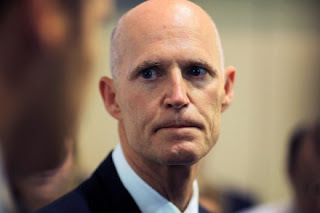 TALLAHASSEE, Fla. — Official-looking but bogus letters telling mostly Republican voters that their citizenship is in question are turning up in Florida, where GOP officials have led efforts to purge noncitizens from registration rolls. The phony letters have been reported in 23 counties so far in an apparent attempt to intimidate voters, Department of State spokesman Chris Cate said Tuesday. Republican Gov. Rick Scott, who pushed for the purge of noncitizens, said Florida has "zero tolerance" for voter intimidation. "Anytime anybody's trying to prevent somebody from voting that's a serious issue," Scott said. "We'll get to the bottom of it. We'll turn over any violations of law to law enforcement. I expect law enforcement to prosecute those individuals." Florida Department of Law Enforcement spokeswoman Gretl Plessinger said the agency was monitoring the situation and opened an investigation late Tuesday. The letters purport to come from various Florida county supervisors of elections but all were postmarked from Seattle. They tell voters that information received from the state Division of Elections indicates their citizenship is in question and that they'll be removed from the rolls unless they can prove their citizenship within 15 days. The letters also warn in bold type that noncitizens who cast ballots "may be subject to arrest, imprisonment, and/or other criminal sanctions." Secretary of State Kenneth Detzner sent a message Monday to all 67 supervisors of elections urging them to report the discovery of such letters to his assistant general counsel. Detzner also noted that voter intimidation is a felony punishable by up to five years in prison and a $5,000 fine. Cate said officials hope the bogus letters are not retaliation for the noncitizen purge. "It would be really disappointing if someone tried to use a successful program to commit voter fraud," he said. The purge has been criticized for inaccurately identifying voters as noncitizens. The state originally sought to remove 2,600 voters but later revised the list to only 198 names. The effort also has drawn court challenges. Two federal judges have ruled the purge could continue, but the Atlanta-based 11th U.S. Circuit Court of Appeals has said it won't resolve the issue until after the Nov. 6 election. The Florida Republican Party, meanwhile, sent a fundraising letter urging those who support the purge to contribute to the GOP.